Have you ever seen a white squirrel? If your answer is yes, there is a good chance you have been to Brevard in Transylvania County, North Carolina. 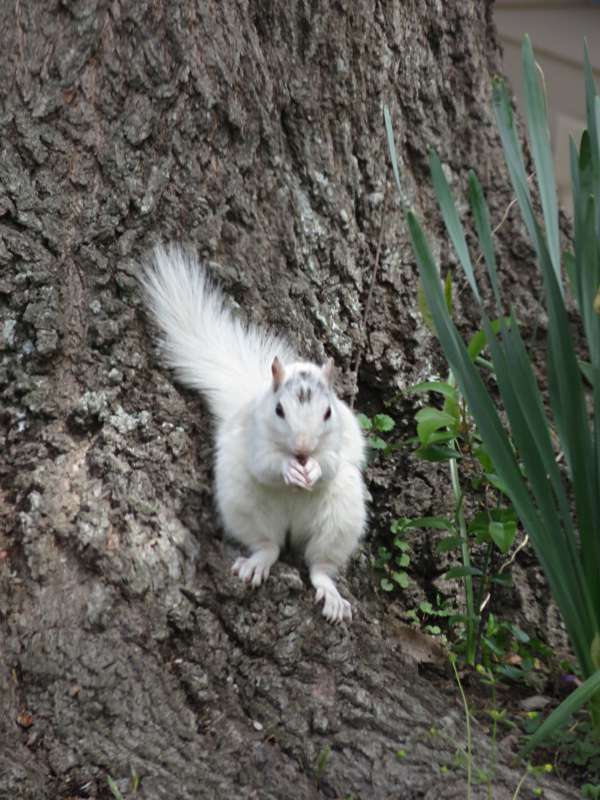 Brevard has a thriving, and much loved, population of white squirrels. They are exactly like their eastern grey squirrel cousins except their fur is snowy white. When David and I read about Brevard's white squirrels we had to go searching for them - well, I had to go searching. David is not much of an animal person but he's always happy to come along on my quests. We had no real idea where to start looking except that David had read the town of Brevard was a good place to start. As it turned out, the squirrels were easy to find. Within a few minutes of arriving in town we spotted a snowy white squirrel in someone's front yard. Then as we headed down toward the Brevard College Campus, a known haunt for the little creatures, according to Google, we saw another and another and another. In all we spotted about six in the space of 15 minutes or so.They were fossicking and foraging alongside a few of their grey furred cousins. Where is the best place to look for white squirrels? The best place to look is Brevard College on N.Broad Street. We arrived during Spring Break so parking was easy and we were able to wander around on our own, happily squirrel spotting. The creek running through the college campus is reputed to be a good place to look, however all the squirrels we saw were on the lawns just inside the main entrance. The squirrels are easy to find - just park your car and look around, especially in and around the trees. Don't be disappointed if you see a few grey squirrels at first. The white squirrel population is estimated at about one third of the overall squirrel population. Another place where they are reputed to hang out is nearby Franklin Park. What makes a white squirrel's fur white? Are they albinos? An albino animal is white because it lacks the pigmentation present in other animals of its species. Albino animals have red coloured eyes because without pigmentation the blood vessel's show through making the eyes appear red. 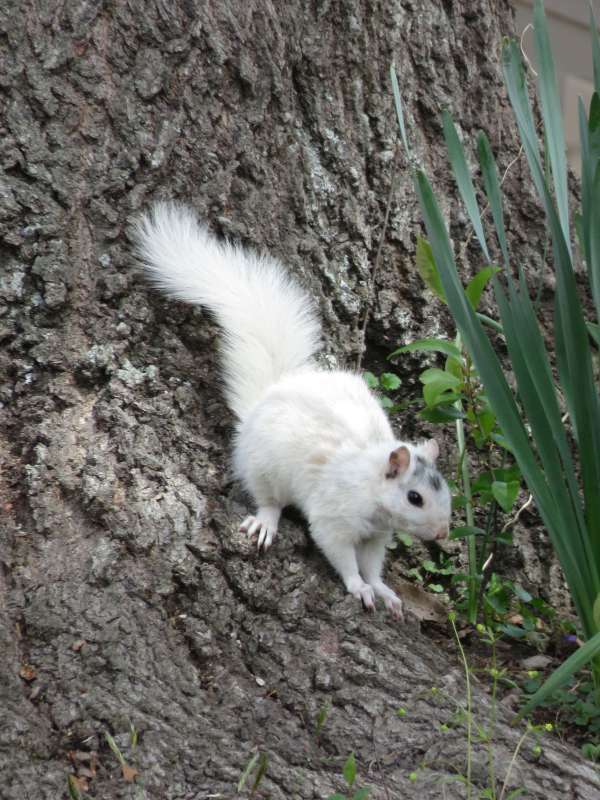 The white squirrels of Brevard have normal-coloured eyes, and although some are completely white not all are. Many have a small patch of grey. Therefore they are not albinos. Nor are they leucistic, a condition which results in a partial loss of pigmentation. What are they then? According to Brevard's White Squirrel Institute they are simply a colour variant of the eastern grey squirrel. In the wild they would be easy pickings for predators but in the urban environment of Brevard they thrive. Where did Brevard's white squirrels come from? Local legend says the squirrels are descended from a pair of animals which escaped from an overturned circus truck in northern Florida. They were captured and given to a resident of Brevard who passed them along to his niece. She tried and failed to breed them. One of the squirrels escaped and the other was released to join its mate. Brevard's white squirrel population are all descendants of this pair. Where the circus got its original pair is not clear. White squirrels have become such a part of local life that Brevard holds an annual White Squirrel Festival in their honour. 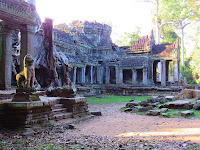 This year's festival will be held from May 25 to May 27. For festival goers who need to be convinced the squirrels exist there are guided white squirrel tours through the grounds of Brevard College. How did the county come to be called Transylvania? We came to Brevard via Savannah, South Carolina, the 'Ghost Capital of America', and I have to admit when I first heard of the white squirrels of Transylvania County I more than half expected they would turn out to be another ghost story. I was wrong. The squirrels are ordinary flesh and blood despite the connotations of the county name. The name is derived from the Latin words trans meaning 'across' and sylvia meaning 'woods'. Feel free to go with the Dracula connection though if you like. Personally, I don't think you should ever let the facts stand in the way of a good story! Where else in America are white squirrels found? 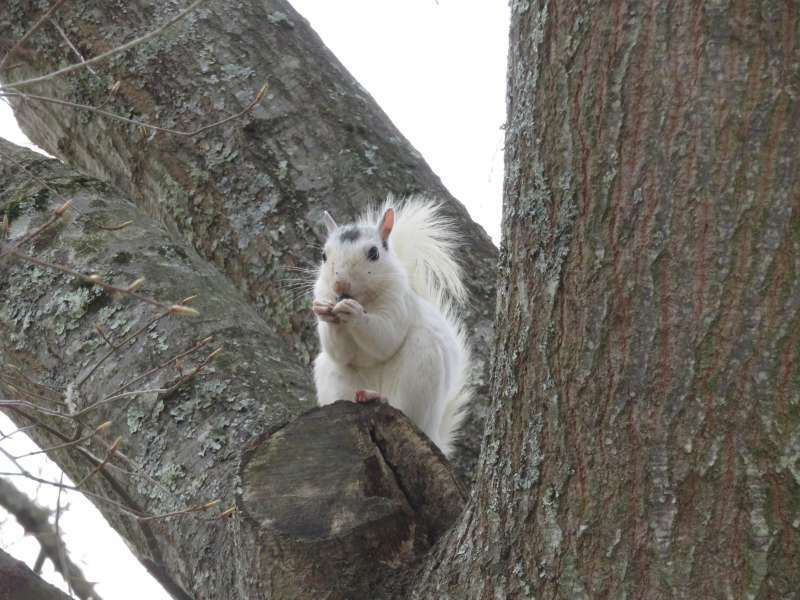 Other places in North America known to have white squirrels, although in lesser numbers than Brevard, are Marionville, Missouri; Olney, Illinois; Kenton, Tennessee and Exeter, Ontario. Have you ever seen a white squirrel? Where was it? What about other unusually coloured animals? I couldn't resist including a photo of my favourite white animal. 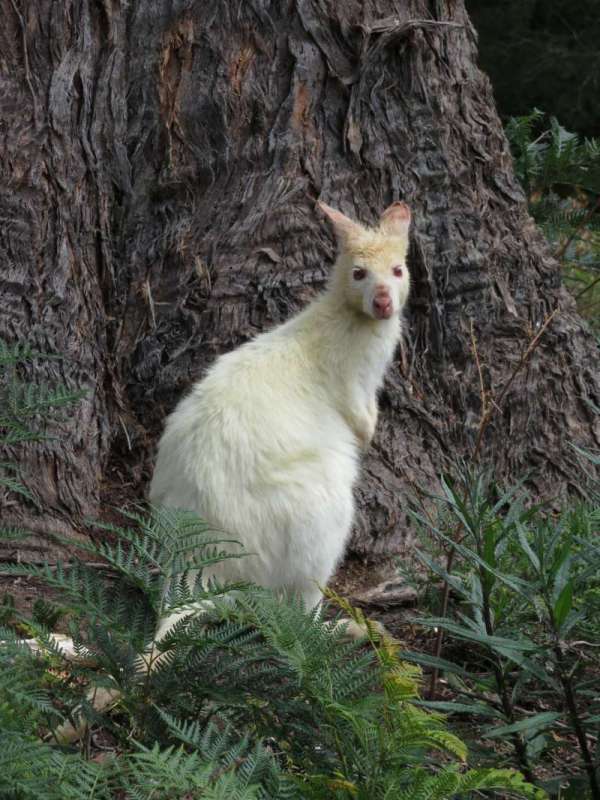 For the story of the White Wallabies of Bruny Island Tasmania, click on the hyperlink. Why we will never visit Kennedy Space Center again! I live close enough to Brevard to make it a day trip and I've enjoyed a visit there a few times. I'd love to make it to the White Squirrel Festival someday. I've also enjoyed shopping there and eating, too - it's quite the quaint town. Glad to hear that you made it close to my neck of the woods - hope you've enjoyed it. What a shame I didn't know you were a native. We spent three days in Ashville. David loves flowers so we mainly went to see Biltmore. We could have tried to meet up. Apart from the white squirrels and Biltmore we got to see hoar frost for the first time in our lives. How interesting that the entire population of these adorable squirrels came from a single pair. With such low genetic diversity they are very vulnerable to any drastic changes in their environment. Hope they stay safe - they are incredibly cute! The town looks after them pretty well I think. They do an annual white squirrel count to check they are thriving. I have seen these white squirrels in Toronto Ontario. I see that one of the areas you mention for finding these unusual squirrels is Ontario. Right in the middle of a metropolis I walked across a park carrying a pink bag with a package of chocolate inside. It was as if I was the Pied Piper of downtown Toronto and the squirrels came running. the white one straight up my leg. I manage to snap a photo of it before i screamed like a wild woman and turned the white squirrel into a flying squirrel. Haha - I hope it was okay but I do understand your fright. I am sure I wouldn't want one running up my leg. So cute - tho the white seems odd! The colour didn't seem that unusual when we were looking at them. Just another variation. I googled white squirrels and discovered that lots of businesses entirely unconnected with small furry animals seem to use the name - lol! 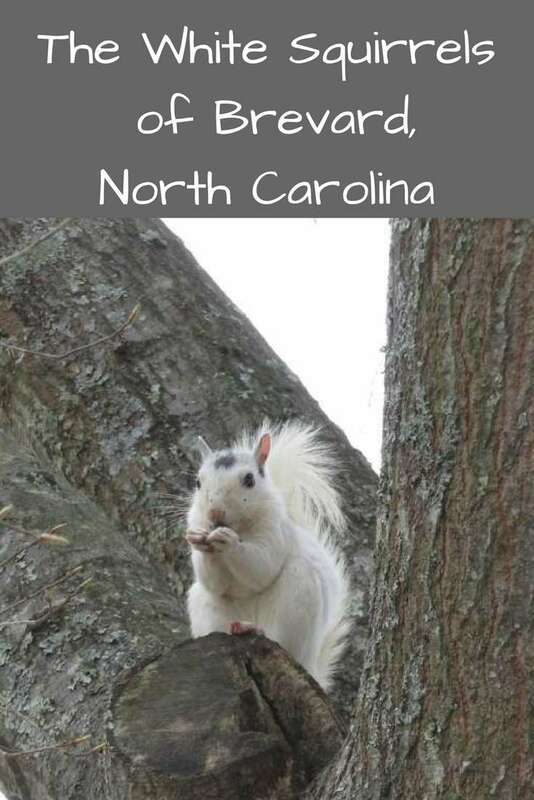 I have never seen white squirrels, neither did I know there is a Transylvania county in North Carolina. Transylvania is a region in Romania and I thought that's the only part of the world that bears that name. I'm going to break the news to my husband because he was born in Transylvania, hahaha! How funny that these squirrels ended up here all the way from Florida. Of course, the entire world associates Transylvania with Dracula, now you can tell them (and hubby) that instead of vampires they should think of fluffy white squirrels. I didn't know about this. They are much cuter than the grey ones! Thanks. I agree. They do look cuter. I didn't know there are white squirrels! They are beautiful. We have grey, red, and black squirrels in Canada. I have heard of grey and red squirrels but not black ones. I would love to see a black squirrel. You are the second person in a row to mention black squirrels. I have never heard of a black squirrel. I wonder if they are just found in Canada. I grew up in Mt. Vernon, Indiana, not that far from Olney, Illinois, where the white squirrels can be seen with some frequency. I have to admit I've not ever seen one with my own eyes but enjoyed your feature and am glad they are still around to be discovered and photographed! David and I are coming back to the U.S next year and I think Illinois is on our itinerary. I will have to include Olney so we can try to see some more. 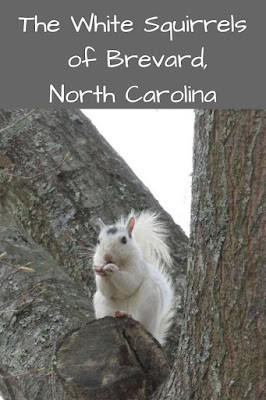 Just put seeing the white squirrels of Brevard in North Carolina on my to-do list! Amazing! If you look around the grounds of Brevard College, especially just as you drive in, you can't miss them. Haha - that would be great! i think the first conclusion you jump to is that they are albino. That's why I put the explanation in about where their white colour comes from. I have never seen a white squirrel. I also did not know there was a Transylvania county in North Carolina. I think the brown patch and stripe make them really cute. It seems I only get to see any type of squirrel when I visit the USA. I love New Zealand but I would hate to live anywhere without animals. Next time you are in Sydney you will have to visit our new digs and see my kangaroos. They come to eat our grass every evening. Never knew about these little critters. I'll keep a lookout if in the places you mentioned they might be found. I like the circus legend -- let's go with that. I agree about the circus legend. There does seem to be some truth in it. I received this comment by email this morning. It is so nice when readers contact me. Thank you Catherine - as you can see I have corrected my paragraph which previously suggested none of the Brevard squirrels were pure white. I hate getting things wrong - even small things. 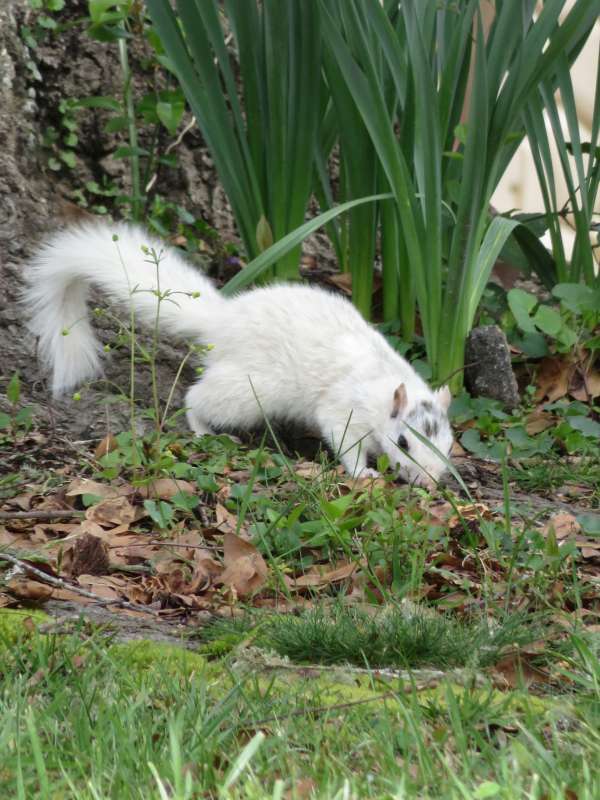 I found you when I was looking up about the white squirrels of Brevard. I have one small correction and that is that there are plenty of white squirrels who are pure white. I live in the Pisgah Forest, just outside of Brevard, and have about 8 white squirrels that feast off my deck daily. Some of them have gray markings but half of them are pure white — unless they are dirty from playing in the mud of which we have plenty right now. There are others which are crossbreeds which do have various gray lines or stripes or marks on them. I have one which I call Elvis because he has a dark spot on the top of his head and sideburns. I enjoyed reading about your adventures and travels!